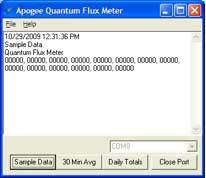 Explains how to use the sample and logging features of Apogee Instruments' handheld meters and gives an overview of the AMS software. The meter display is the biggest draw on the battery. The display is designed to shut off if there hasn’t been any activity (button pushing) for two minutes. The battery life can be extended by manually shutting off the display using the power button. The meter will continue to record data even when the display is turned off. Pushing the power button again reactivates the display. The second biggest draw on the battery is long-term storage, even when the meter is not in use. The microcontroller is always on and using a small amount of power. We recommend removing the battery for storage longer than nine months to preserve battery life. The meter should normally be turned off before removing the battery. Removing the battery while the meter is on and reinserting it after a few seconds is the master reset, which will erase the data in storage. 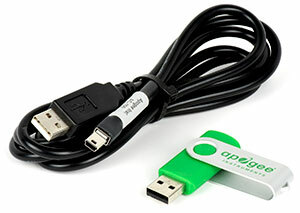 The AC-100 communication cable accessory from Apogee has been uniquely designed to work with the meter and is necessary to download the data to a computer. The meter outputs data using the UART protocol and requires the AC-100 to convert from UART to USB. Other cables with the same connectors on the ends cannot make this conversion. The data transmitted to a computer is usually changed into a more readable format by clicking on the file option in the upper left hand corner and choosing one of the two options. Both options transfer the data to a spreadsheet in a vertical configuration. This allows for other parameters, such as time/date, to be entered and auto-filled in the spreadsheet. The most accurate way to know the time of the 30 minute average is by adding 30 minutes to the time when the meter was put into Log Mode. If the start time is not known, the end time can be used but this is less accurate because the number of minutes into a 30 minute average is unknown. The daily total is often more important and is calculated and stored in the meter. The meter is designed to detect when it is night and uses that information to calculate the daily total. The last value in the daily total data, thus, always represents the previous day. Error codes will appear in place of the real-time reading on the LCD display and will continue to flash until the problem is corrected. For steps on completing a fix, please refer to the manual. A master reset can be performed to resolve problems such as those listed above in the errors. *Note: a master reset will erase all logged measurements from memory. To perform a master reset first press the power button so that the LCD display is activated. While still powered, slide the batter out of the holder, which will cause the LCD display to fade out. After a few seconds slide the batter back into the holder. The LCD display will flash all segments and then show a revision number. This indicates the master reset was performed and the display should return to normal.